In the nearly 60 years that I’ve been kicking dirt on this planet, economic systems have gone through significant changes. The industrial manufacturing base in the United States has been strip-mined, privatization of public resources has enriched corporations and cost the population more for life-giving necessities such as water. The cost of education has left students with debt the size of a mortgage and no employment. But the elite capitalist class is doing just fine, and that’s by design. Who are the people that actually run the damned world? It’s not the presidents and prime ministers, or some unknown cabal. 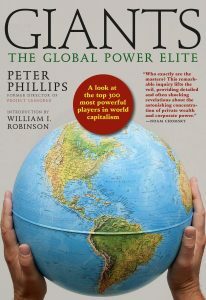 It’s people that control the Transnational Capitalist Class (TCC), and Professor Peter Phillips has written a book that provides a road map to navigate this interlocking directorate of corporatism. In his new book “Giants – The Global Power Elite”, Professor Phillips has drawn on the legacy of the C. Wright Mills classic 1956 work “The Power Elite”, and hundreds of other sources. The book is well laid out, reads well and has almost 300 footnotes – a sign of serious background work. “This book is an effort to bring awareness of the importance of systemic change and redistribution of wealth, to readers as well as to the Global Power Elites themselves, in the hope that they can begin the process of saving humanity”. That’s a tall order to fill, getting the elites to wake up to the environmental and economic nightmare the rest of us are experiencing, let alone convincing the paramilitary brown-shirts that reside in their camp. But let’s give Professor Phillips high marks for providing us this blueprint. The book begins with an introduction by William I. Robinson titled “Who Rules The World?” Robinson contends that “500 years of capitalism had led to a global epochal shift in which all human activity is transformed into capital”. Robinson views the Transnational Capitalist Class as an international elitist system that shares similar lifestyles, education and consumption patterns. They do not rely on the steady hand of any one nation, and may represent what we loosely refer to as “The New World Order”. Surely we will see it includes criminal elements as well, such as the drug cartels and the banks who launder their money. Each chapter lays out in detail how specific parts of that system works, and then names the elites running that part of the system, be it banks, media, military and non-governmental organizations. “The danger is that the Global Power Elite will fail to recognize the inevitability of economic and/or environmental collapse before making the necessary adjustments to prevent millions of deaths and massive civil unrest”. Such is the intent of this fine book; to educate us as readers or activists – and to signal to the elite that the whole world can come crashing down around them too. This entry was posted on December 16, 2018 at 9:51 pm and is filed under Book review. You can follow any responses to this entry through the RSS 2.0 feed. Picked up a copy pf Phillips book after reading this review, figuring it was time for a reset, I am now about halfway through this latest version of who rules the world. Over the years I have read a number of similar works including Ferdinand Lundberg’s, The Rich and The Super-Rich; The Power Elite by C.Wright Mills and William Domhoff’s most excellent book, Who Rules America? One of the things that seems most apparent to me is that as each generation produces its own synopsis of this topic, the number of names that appear on the list keeps shrinking…a concentration of power, if you will, even among the world’s most financially and politically powerful movers and shakers. Another changing paradigm among the power elite is the clear and recognizable shift from dynastic fortunes that are centered around a patriarchal family figure, to dynasties that are corporate in nature, and tend to center around CEOs who function somewhat like de facto heads-of-state. The leaders of these corporate dynasties are typically NOT among the richest individuals in the world, or anywhere close for that matter. The paltry few billion that some of these powerful technocrats are worth pales in comparison to the mega-fortunes of the truly “super-rich,” who now days possess amount of money so vast that it would have made good old Ferdy Lundburg blush! 4) Heads of global financial services firms. So few are the numbers these days that Phillips identifies no more than 17 firms and 199 individuals that represent the titular head of global capitalism as we make our way toward the third decade of the 21st century. If you view this as a problem then you could argue that the old Biblical prophesy about Jesus entering the Temple to drive out the money-changers may well have been yet another religious fable that that was based loosely on fact? That concentration of wealth leads to a concentration of power, and vice versa…and it is just this concentration of economic wealth and political/military power that has brought us to the brink of extinction, all with perhaps no more than a few hundred individuals who are truly to blame. Brian Burden on Carroll Jarnagin; Did He Actually Witness Ruby With Oswald? JDW on Carroll Jarnagin; Did He Actually Witness Ruby With Oswald?